Happy Monday! I hope you all had a fabulous weekend. We had PERFECT weather here in Utah over the weekend. It was the high 70’s and low 80’s all weekend long with plenty of sunshine. 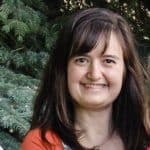 I went on a long walk with my mom at the park while my children played on the playground. It was such beautiful, perfect weather. Then my girls and I went to “The Wizard of Oz” at our local theater and enjoy a fantastic performance. How was your weekend? Anyway, as the weather starts to cool down, leaves start to change colors (only in the mountains right now), and the football season gets into full swing, I think of two things…I am actually looking forward to wearing my hoodies again (but no snow please), and I want everything I eat to have pumpkin in it (is that too much to ask?). Fall flavors and smells make the thoughts of cold weather and snow a little more bearable…honestly, if we skipped winter all together I would not complain one bit :). I obviously can’t stop winter from coming (trust me if I could I would), but I can eat A LOT of pumpkin to help me forget that I live in Utah where it snows all winter long, and these muffins are the perfect way to drown my winter woes and help me enjoy the beautiful fall season. The almond butter glaze is optional, but I can’t think of any good reason to leave it off of these Grain-Free Pumpkin Muffins. It makes them taste like you are eating dessert for breakfast, and let’s be honest…if it was socially acceptable and didn’t negatively affect your waistline who wouldn’t eat dessert for breakfast – daily? Luckily, for all of us, Grain-Free Pumpkin Muffins are totally socially acceptable for breakfast, and these will NOT be negatively affecting your waistline – – so eat up and enjoy. I know I will! 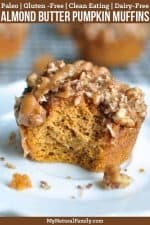 While you are here, you should check out my Paleo Pumpkin Muffins with Almond Flour for a similar but really totally different type of muffin. I would love to know how your weekend was and if you like this recipe. Please comment below! 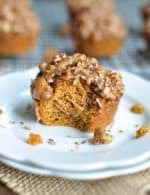 These Grain-Free Pumpkin Muffins with almond butter and nut streusel topping are big, fluffy, moist, and bursting with pumpkin flavor. No one will believe that they are healthy, gluten-free, grain-free, and Paleo friendly. Not all almond butter is created equal, if your batter is runny and not a cake-like batter consistency, add 1 Tbsp coconut flour at a time until that consistency is reached (be careful with adding too much coconut flour) – 2 Tbsp was the perfect amount for the almond butter I used (Kirkland Brand). Oh no, I am so sorry. I make these muffin all the time, so I promise when they are not mushy they are fabulous – – that dang almond butter :(. They were not wasted! I gobbled them up anyway and they were delicious even with being slightly mushy! I think with just a tad more flour they will be perfect!! Thank you for a great site with great recipes that are healthy! I love your style! That is exactly what I would have done :). Thanks for your support. Would this work in a pie tin you think? It should work, you will just have to bake it longer. Oh good! I hope you like them as much as we do. I actually just made a batch this morning! Thank you for this recipe. The flavor, unadorned, is delicious…but, I think perhaps there is an error in the ingredients. I am going to try it again using double the coconut flour in the ingredient list because they came out really mushy, even after 25 minutes in the oven (toothpick just would not come out clean!) My whole family agreed, though, that the flavor was perfection!